Lead-free perovskite (Bi0.5Na0.5)0.92Ba0.08TiO3 (BNBT08) was prepared at 1160ºC/3h in air atmosphere by conventional high temperature solid state reaction ceramic fabrication technique. 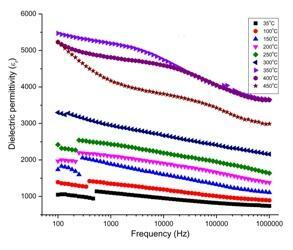 The crystal structure, microstructure, dielectric, piezoelectric properties, and ac conductivity of the sample were studied. X-ray diffraction data confirmed the formation of a single phase tetragonal unit cell. Williamson-Hall plot was used to calculate the lattice-strain and the apparent particle size. The crystallite-size was found to be ~18 nm. The experimental relative density of BNBT08 was found to be ~96-97% of the theoretical one with an average grain size ~2.5 μm. Room temperature dielectric constant and dielectric loss tangent at 1 kHz were found to be equal to 1100 and 0.105, respectively. Longitudinal Piezoelectric charge coefficient of the poled sample under a dc electric field of about 2.5 kV/mm applied for 15 minutes at 80ºC in a silicone oil bath was found to be equal to 112 pC/ N. The high value of dielectric constant, relatively low loss factor, and high piezoelectric charge coefficient of the test ceramic sample showed the candidature for its usefulness in various electronic and other sensor/actuator applications. The Nyquist plots and conductivity studies showed the NTCR character of BNBT08. Jump Relaxation Model (JRM) was found suitable in explaining the mechanism of charge transport in BNBT08. The ac conductivity data provided apparent activation energy, and density of states at Fermi level. Activation/binding energies associated with different types of conductivity have been evaluated and the results have been analyzed in detail.